Concrete ​driveways are​ ​durable, easy to clean and cost-effective for large areas (if your driveway is intended for 3 or more vehicles). Lifetime of up to 20 years - We reinforce concrete driveways with either a fiber or wire mesh to strengthen their structure, prevent shrinkage and improve surface permeability. We pour concrete at no less than a 75mm depth and up to 150mm, depending on the existing surface. Can be laid on pretty much any surface - even mud! Minimal maintenance - Stains come off easily with pressure washing (unlike tarmac) and weeds won’t grow through it. Drainage systems fitted - Eco drains, soakaways, recess covers, etc. Fast installation - Curing (drying out) process takes between 1 to 7 days, depending on weather conditions and the type of concrete and finish. We recommend applying a concrete sealer for extra protection. Many colours and finishes - Make your driveway really stand out! Contact us today to arrange a free, no obligation quote for your concrete driveway! We install concrete driveways across Devon, Cornwall, Somerset and Dorset. Floating (trowelling) – You’ll be familiar with seeing pavers using a hand trowel to level the wet concrete floor and give the surface that super-smooth finish… that’s what “floating” means! Power floating – Similar as above but using a power trowel for large areas. Brush (broom) – A brush or broom is applied on wet concrete to make the surface less slippery once it’s cured (dried). This is useful consideration in rainy England as your concrete driveway will become wet due to the elements for most of the year. Edging – Instead of the edges of your concrete driveway being at a sharp angle, we give the edges a more rounded, bevelled finish and create joints. That’s not just for cosmetic reasons - edging helps minimise risks of cracks. Stamped (imprinted patterns) – Think of a giant stencil applied on the still-wet concrete surface to produce pretty patterns once it’s dried. That’s pretty much it, although we’ve simplified it a bit! 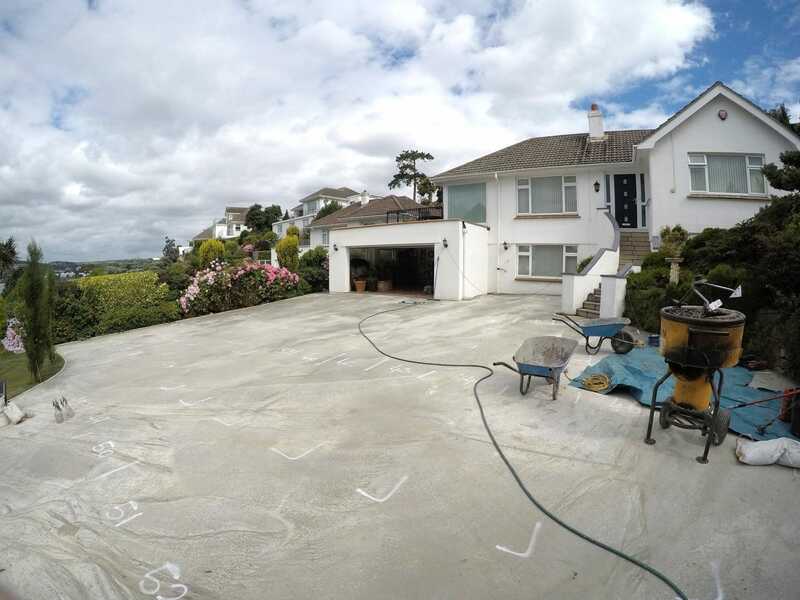 Concrete provides an ideal solution as a stable sub-base onto which to lay a resin driveway if the original surface is not structurally sound enough to pour the resin directly onto it. For this type of application, we’d first need to excavate and do the necessary groundwork preparation. Our experienced surveyors will help you choose the most suitable solution for your project. Contact us today to arrange a free, no obligation quote!